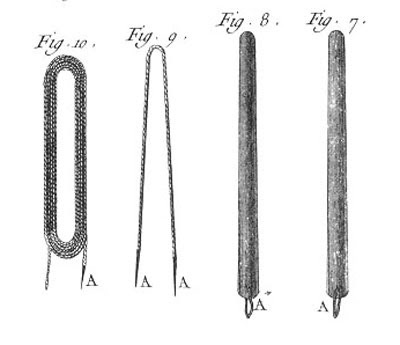 M. Diderot in his Encyclopedia gave us these detailed drawings of some interesting stay accessories. These plates were published in 1771 as plates in the Tailor of Suits and Tailor of Bodices chapter. The question often arises among re-enactors who wear stays is what to use to lace them up? Here are the examples we have to go by, the aiglet is integral to the stay braid/cord. We often use bodkins or even bobby pins in a pinch to help lace up a pair of stays. How much easier to have a built in bodkin, eliminating the bulk of pulling a doubled cord through the eyelet hole. This example of an advertisement shows us how the stay cord was listed for sale, along with other small woven goods such as ferrits (woven tape) and galoon (trim). Of great interest is that I can find no busks for sale. None, zip, nada Unless my gentle readers can find me one! We know from extant busks that they were often personalized and carved by men for women.